Although my nose and ears were burning having still not managed to apply the correct amount of sun lotion the temperature was a lot cooler in the shade. I spent a lot of time stepping in and out of the shadows to decide if it was going to be warm enough to welcome the evenings audience. The site we had selected for our performance in Bardsea was a lovely garden in the grounds of the Malt Kiln. The venue itself is a beautiful and well appointed village hall and judging by the posters advertising coming events the building was well used and cherished by the locals. Beautiful as the garden was the problem of the temperature in the shade still troubled me. We found a small turning to the left hand side of the hall that revealed a beautiful raked patch of grass freshly mown with hedgerow on either side that would suit our show perfectly. A quick calculation revealed that at the appointed time of our performance the sun would be lighting our faces as it descended and our audience would enjoy a comfortable and warm orchestra stalls. We met Dorothy from the Village Hall committee who helped us set up for the show and gave us keys to the building where we were to spend the night. We had a good crowd and a mixture of local village folk, a spattering of punters we had met along the way and a collection of musicians called Blast Furness who had come together for their weekly rehearsal. As we were still close enough to home we also had a collection of friends and family and even a theatre reviewer from The Observer. The show went very well despite a few niggles yet still our audience enjoyed our stumbles and as always with hiccups there was much mischief added to the show. We were also joined on stage by a colony of wasps nesting nearby who added both comedy and drama to the proceedings. Thankfully though no tragedy as we were free from stings by the curtain of the show. Having forgotten to make collection at our premier our second show produced a fat hat to a total value of £64.53 and having packed down and loaded Dolly into the hall we were intent on spending it in the village pubs. This proved difficult however as we had earlier been invited to a party to celebrate two local birthdays and on arrival in The Ship we gave a swift performance by way of birthday present and were treated to free beer and buffet for the rest of the night. I recommend the Black Sheep. Awaking in The Malt Kiln we were again treated to breakfast by our mate Alec who cycled from Barrow with some warm pies and we then gathered alongside the Ulverston Walking festival to tramp into Lantern House. By ten o’clock we were trundling out of Bardsea sharing stories along the way with our walking festival partners. Notable was a story from Jean Povey that involved a consignment of fair trade condoms lost to the sea off the coast of Papua New Guinea, a Suzuki land rover and some bloke with a bed of nails. Paddy Dillon was also with us a chap who has written over 50 books cataloguing various walks around the planet. He’s a true local adventurer and as such i was very proud when he took Dolly for a spin and commented on the perfection of her balance. Dolly also had her first flat tire along the way but we all pitched in to tilt her over and she was quickly changed and back on the road. 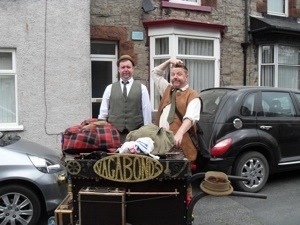 When visiting Ulverston I always pay homage to the greatest showman of them all Stan Laurel and The Vagabonds stopped off en route to doff our hats and pay respects.On a previous vagabond adventure as sprightly 20 year old i once busked my way across America playing two tunes on a rusting old accordion. When i arrived in Hollywood i made sure to seek out Laurels Golden Star cemented into the boulevard and was most disappointed to find his tribute covered in dust next to a building site. I got on my hands and knees in front of all the tourists and polished it until it sparkled. I hope we have time to take Dolly to visit the statue tomorrow. We arrived at Lantern House on the stroke of midday, waved goodbye to the walking festival crowd as they huddled off together for their next adventure around Ford Park. The walking festival runs until the 8th of May. Lord Gregg and me spent a good chunk of last nights takings in the delicatessens and feasted well on olives, cheese, meats and Australian root beer. I sit now in Lantern House drinking coffee and looking forward to this evenings performance a warm soft bed and a fresh shirt to be delivered from home. Now wheres the shower in this building?